Scrubbles has been cleaning hundreds of homes a week for over 35 years. 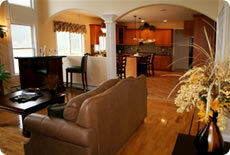 We pay attention to the details, cleaning your home the way you would if you had the time. Plus, you can relax knowing that all of our cleaning professionals have undergone extensive training and are fully bonded and insured. Our process begins with a free in-home estimate. We will walk through your home with you and discuss your unique cleaning needs. You decide what schedule is best for you and we will do the rest. We offer personalized house cleaning services that fit your schedule. Make your life easier with regularly scheduled cleaning services. You pick the services and schedule that are best for you! One-time cleans for whatever your needs may be—special events, holidays, or just some assistance when you need it. A customized one-time intense clean for when you need every nook, cranny and surface to be spotless. You choose how deep we go! Special deep cleanings specifically designed for handling the mess of moving out, or preparing a residence for a new occupant.